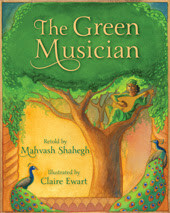 The first book I am sharing is The Green Musician retold by Mahvash Shahegh and illustrated by Claire Ewart. This is a 1,000-year-old Persian tale retold. Now when we first read it, we happened to be with my 13-year-old nephew who is quite a musician. He previewed the book for me and told me it was good. He had been asking me questions about my blog and my reviews so I let him review it. He also came in for bedtime story time each night that we were at my parents together. Hazel read a book to him and my father and then I read to all of them. The last night we were there Hazel got tired reading her book, but really wanted to finish it, so he read to her. It was so sweet. Ok, back to The Green Musician. This is a beautiful book about a young man who pursues his dream. He does not let anything or anyone get in his way. 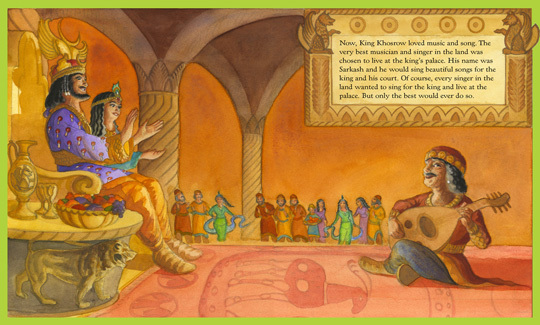 Barbad's dream was to play his music for the king. He made an appointment to do so, but the king's musician worried that he would be replaced and managed to delay Barbad for over a year. Barbad came up with another plan and with the help of the king's gardener, Barbad hid in a tree when he knew the king would be in the garden. Barbad perseveres and the king loves his music. I will leave it at that and let you read the story to know all that happens in the end. Now the illustrations are beautiful in this book. They help the reader picture the landscape of Persia. The story itself gives the history of the country as well as a story that has been told there for 1,000 years. It is a wonderful book and we highly recommend it. 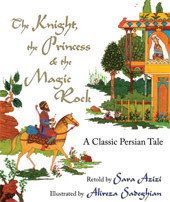 The second book is another classic Persian tale it is The Knight, the Princess and the Magic Rock retold by Sara Azizi and illustrated by Alireza Sadeghian. According the the Author's Background Note, this tale was featured in Shahnameh or Book of Kings which was written around 1000 A.D. by the Persian poet Ferdowsi. This version is based on the commentary of Adham Kalkhali, a Sufi or Islamic mystic who died in 1642 A.D. In this story the king of Persia sends one of his knights, Bijan, to help some farmers on the edge of his kingdom. Bijan goes to deal with the wild boars that are destroying the farms and on his way home he passes through a neighboring kingdom which happens to be an enemy of Persia. While passing through Bijan comes upon the enemy's princess, Manijeh, and falls in love with her at first sight. She also falls in love with Bijan. When it is time for Manijeh to return home to her father's palace, she cannot bear to part from Bijan. She drugs him and has him brought into the palace and hidden away. However, the king soon discovers Bijan and punishes the young couple. He puts Bijan in a deep hole and has the soldiers cover the hole with a magic rock that cannot be moved. The king also banishes his daughter. She finds the pit and feeds Bijan through the small hole that is left beside the rock. The king of Persia hears about Bijan's troubles and sends a famous warrior to save him. Manijeh helps the warrior and all return to Persia. This book also has beautiful illustrations. The illustrations are a different style than The Green Musician. Both however provide an image of life and landscape in Persia. The story itself gives information about the life, the boars, the knights and warriors, the palanquin and so much more. Both books are a wonderful way to introduce younger children to Iran. 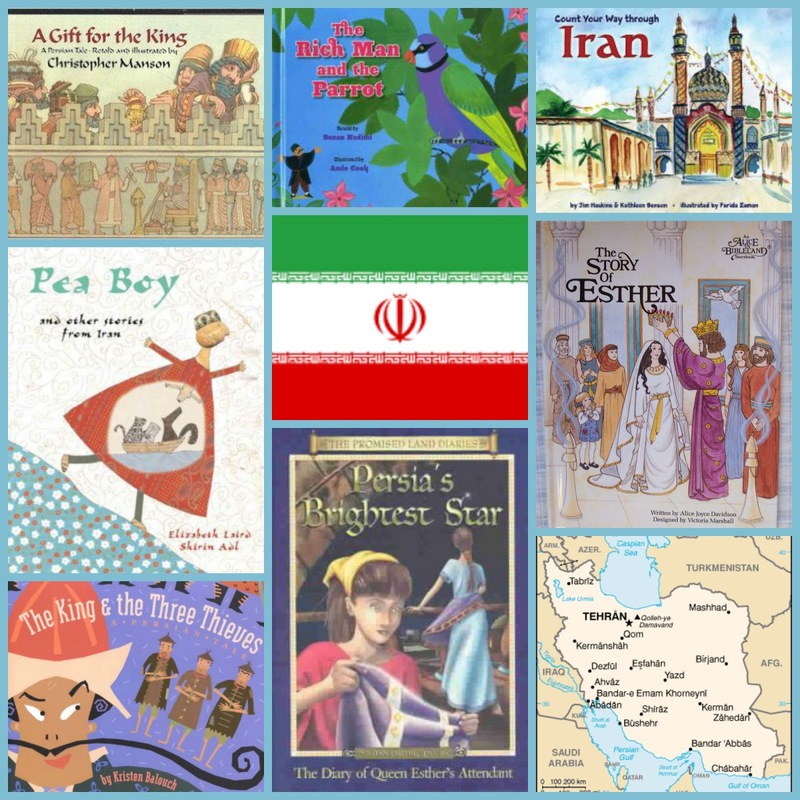 We also found a few books at our public library with stories from Iran. We have not read all of these yet, but will be working our way through them this month. Hazel is extremely excited to read more about Queen Esther, so I know we will be doing something with her story. 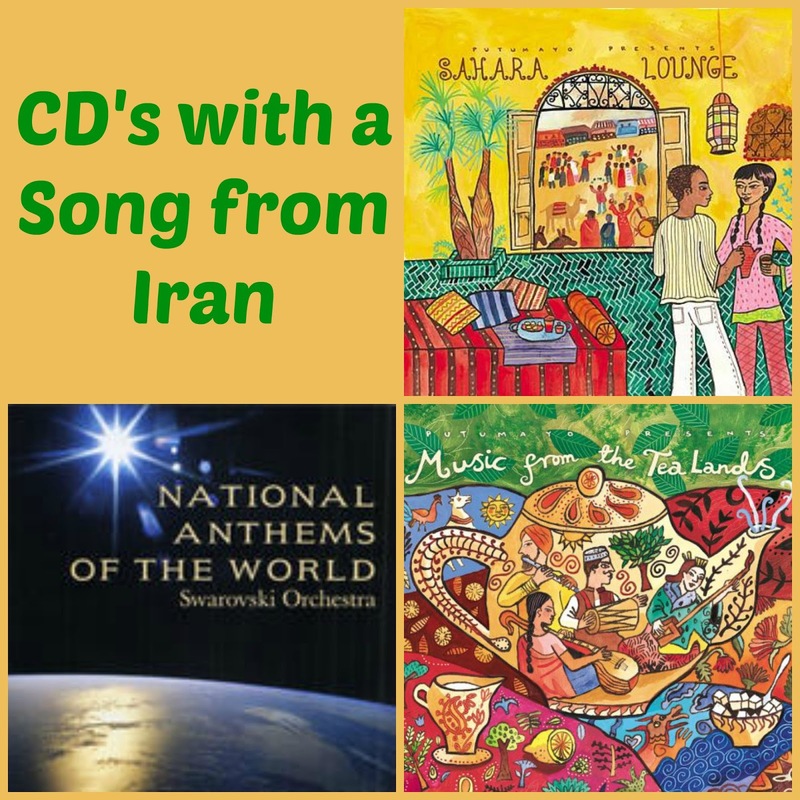 We also have been enjoying some music from Iran. We managed to find three CD's each with a Iranian song on it. This month we will continue to explore Iran by looking at its stories, books about the country and food. 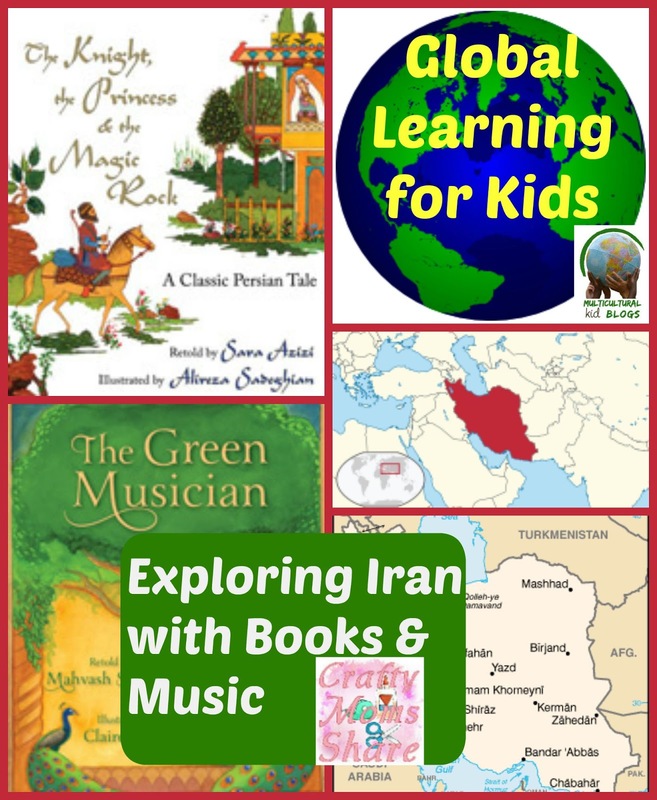 Plus we will be doing some fun Middle Eastern and North African posts for the blog series. Make sure you enter the giveaway so you can have a chance to win these two terrific books! !